This white paper is intended for datacenter architects as well as a general audience that either has responsibilities around automation projects or is a stakeholder or customer for automation projects. Complexity and scale adds cost both in terms of hardware to deploy, and man hours to maintain. Data management solutions that simplify the recreation of production environments are creating waves in the DevOps process. Advanced application management tools like Puppet and Chef have grown to be leaders in maintaining a consistent environment, but still lack the data component that drives a significant amount of cost. 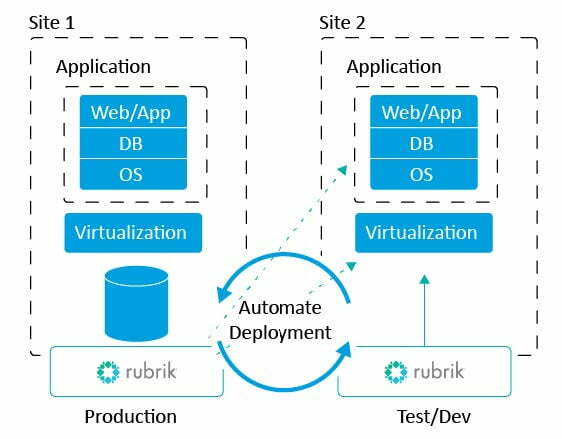 Rubrik’s Cloud Data Management platform fills a gap in modern DevOps ecosystems that can drive down costs and improve overall speed of development. We define Nearline DevOps as the ability to leverage an existing backup of production to provide capacity and capability to engage in testing and development, without having to duplicate your entire storage infrastructure and automate dozens of deployments. 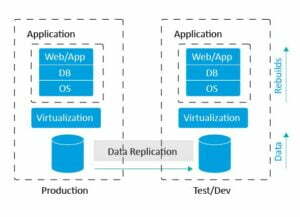 This white paper outlines methods for leveraging Rubrik and automation to reduce your DevOps hardware footprint and increase the speed at which production is recreated for testing. Rubrik’s Cloud Data Management platform can solve for the movement and recreation of both production data and applications. 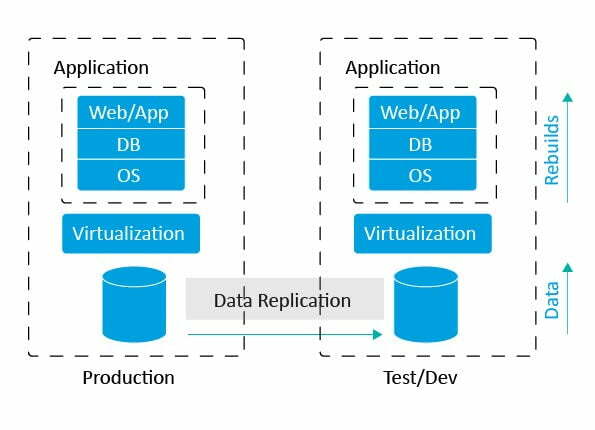 Deployed as a data protection solution, Rubrik acts as a storage platform for backing up the production environment. Scale-out architecture allows the data stored in Rubrik to be presented to the development compute environment in an actionable state. Because the data is an exact replica of production, protected within a minimal time frame, and made available nearly immediately, Dev/Test environments become meaningful representations of production. Deploying replicas of production and then executing code that is in development is one example of how Nearline DevOps reduces risk to the production environment. Executing test code against an identical replica of production ensures that code is put through a real-world set of data. Documentation created from interacting with replicas of the production environment can be leveraged to correct bugs and account for unexpected variations (like improper field formatting) that are always present in production. The State of DevOps Report 2017 showed that mature DevOps environments have a 3x lower change rate failure as compared to more traditional patching approaches. An overview of a traditional DevOps environment is depicted below. Environments today are often challenged with Operating System mismatches that are time-consuming to build and expensive to maintain. Rubrik can solve for these challenges. Rubrik is a single-software fabric that manages all application data in the cloud, at the edge, or on-premises for many use cases, including: backup, recovery, archival, analytics, development, and cloud. Cerebro, the “brains” of Rubrik, operates alongside Atlas (cloud-scale file system built from scratch), providing a global index and catalogue that can be accessed at high speeds. Rubrik is built as a scale-out cluster that removes single points of failure and scales linearly in both performance and capacity. Web-Scale Architecture: Rubrik adopts the same web-scale technologies used by Google, Facebook, and Amazon, allowing users to easily handle rapidly increasing volumes of information with a linear architecture. Nearline DevOps provides a method for companies who are starting their DevOps journey, as well as those who have a mature DevOps environment. Implementing a DevOps environment can be a challenging task for the most veteran IT shop. Leveraging a services partner for the design and build out of your Agile/DevOps environment can ensure you see the return on your investment as rapidly as possible. Unissant provides Agile/DevOps services to both Federal and Commercial clients and has partnered with Assured Data Protection to deliver the complete Nearline DevOps experience to your IT environment. Assured DP provides a managed Rubrik as a service platform, on top of which Unissant builds out automation, processes, and procedures to ensure you can meet the strict compliance requirements of your organization. Andrew Eva has 20 years of experience in IT Services ranging from infrastructure to product design and implementation. He has spent a majority of those years with a deep focus in storage and backup technologies for organizations ranging from small business to Fortune 10 companies. Prior to joining Assured DP, Andrew served as the Sr. Product Manager at Verizon Enterprise solutions, overseeing all products relating to storage as a service products including Backup, Disaster Recovery, Object Storage, and cloud-based storage management. As a founding member of Assured, Andrew is responsible for the technical direction and strategy for both operations and long-term vision. Unissant is a CMMI Level 3 Dev, ISO 9001:2015, and ISO 27001:2013 SDB company with offices in Reston, Virginia and San Antonio, Texas. In August 2015, Unissant was named by Inc. Magazine as one of the nation’s fastest- growing private companies. Unissant is an innovative data analytics and software development consulting company that provides state-of-the-art enterprise data management & analytics solutions to commercial and government clients. Unissant understands its clients’ business needs and technical challenges and provides targeted, cost-effective, reliable business intelligence solutions that help them stay focused on business and meet their business objectives. Using rigorous requirements gathering, best in class technical expertise and award- winning creative talent, Unissant has the best combination of skills to help its clients design and deploy successful business intelligence projects. Unissant’s clients range from small-midsize enterprises to Fortune 1000 companies and large federal agencies, Unissant has developed strategic relationships with global partners to ensure that we provide world-class services. Assured Data Protection specializes in data protection and disaster recovery services for large SME and enterprise organizations. Assured DP has built a fully managed service overlay around their core technology provider Rubrik. Rubrik-as-a-Service delivers an all-encompassing solution that enables their clients to focus on what really matters: their own production environment. With the increasing transition of workloads into the virtual space, traditional backup products are simply adapting to change rather than innovating and evolving. This presents solutions that struggle to keep up with advancements in technology, as they must modify the ageing code base from a physical tape based requirement to a virtual, disk or cloud based solution. The result is limited and slow innovation in the backup and recovery market. Rubrik are changing this trend by completely reinventing the way backup and disaster recovery is implemented and managed for businesses. The notion that any backup solution is sufficient to be compliant, that disaster recovery rarely works, and that its onerous and expensive to manage, is something that Assured DP tackle head on. Assured DP’s solutions are designed to meet compliance requirements, and can be installed and configured within 30-60 minutes. This is a cheaper and simpler solution to manage, with clean and intuitive HTML5 interfaces. There is no other product that can deliver this level of functionality and service at such a low cost.